The aardvark (/ˈɑːrd.vɑːrk/ ARD-vark; Orycteropus afer) is a medium-sized, burrowing, nocturnal mammal native to Africa. It is the only living species of the order Tubulidentata, although other prehistoric species and genera of Tubulidentata are known. Unlike other insectivores, it has a long pig-like snout, which is used to sniff out food. It roams over most of the southern two-thirds of the African continent, avoiding areas that are mainly rocky. A nocturnal feeder, it subsists on ants and termites, which it will dig out of their hills using its sharp claws and powerful legs. It also digs to create burrows in which to live and rear its young. It receives a "least concern" rating from the IUCN, although its numbers seem to be decreasing. The aardvark is sometimes colloquially called "African ant bear", "anteater" (not to be confused with the South American anteater), or the "Cape anteater" after the Cape of Good Hope. The name "aardvark" (Afrikaans pronunciation: [ˈɑːrtfɐrk]) comes from earlier Afrikaans (erdvark) and means "earth pig" or "ground pig" (aarde: earth/ground, vark: pig), because of its burrowing habits (similar origin to the name groundhog). The name Orycteropus means burrowing foot, and the name afer refers to Africa. The name of the aardvarks's order, Tubulidentata, comes from the tubule-style teeth. The first unambiguous tubulidentate was probably Myorycteropus africanus from Kenyan Miocene deposits. The earliest example from the Orycteropus genus was the Orycteropus mauritanicus found in Algeria in deposits from the middle Miocene, with an equally aged version found in Kenya. Fossils from the aardvark have been dated to 5 million years, and have been located throughout Europe and the Near East. The aardvark is vaguely pig-like in appearance. Its body is stout with a prominently arched back and is sparsely covered with coarse hairs. The limbs are of moderate length, with the rear legs being longer than the forelegs. The front feet have lost the pollex (or 'thumb'), resulting in four toes, while the rear feet have all five toes. Each toe bears a large, robust nail which is somewhat flattened and shovel-like, and appears to be intermediate between a claw and a hoof. Whereas the aardvark is considered digitigrade, it appears at time to be plantigrade. This confusion happens because when it squats it stands on its soles. Aardvarks live for up to 23 years in captivity. Its keen hearing warns it of predators: lions, leopards, hunting dogs, hyenas, and pythons. Some humans also hunt aardvarks for meat. Aardvarks can dig fast or run in zigzag fashion to elude enemies, but if all else fails, they will strike with their claws, tail and shoulders, sometimes flipping onto their backs lying motionless except to lash out with all four feet. They are capable of causing substantial damage to unprotected areas of an attacker. They will also dig to escape as they can, when pressed, dig extremely quickly. Their thick skin also protects them to some extent. The aardvark is nocturnal and is a solitary creature that feeds almost exclusively on ants and termites (formivore); the only fruit eaten by aardvarks is the aardvark cucumber. In fact, the cucumber and the aardvark have a symbiotic relationship as they eat the subterranean fruit, then defecate the seeds near their burrows, which then grow rapidly due to the loose soil and fertile nature of the area. The time spent in the intestine of the aardvark helps the fertility of the seed, and the fruit provides needed moisture for the aardvark. They avoid eating the African driver ant and red ants. Due to their stringent diet requirements, they require a large range to survive. An aardvark emerges from its burrow in the late afternoon or shortly after sunset, and forages over a considerable home range encompassing 10 to 30 kilometres (6.2 to 18.6 mi). While foraging for food, the aardvark will keep its nose to the ground and its ears pointed forward, which indicates that both smell and hearing are involved in the search for food. They zig-zag as they forage and will usually not repeat a route for 5–8 days as they appear to allow time for the termite nests to recover before feeding on it again. 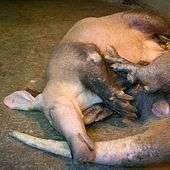 Aardvarks pair only during the breeding season; after a gestation period of seven months, one cub weighing around 1.7–1.9 kilograms (3.7–4.2 lb) is born during May–July. When born, the young has flaccid ears and many wrinkles. When nursing, it will nurse off each teat in succession. After two weeks, the folds of skin disappear and after three, the ears can be held upright. After 5–6 weeks, body hair starts growing. It is able to leave the burrow to accompany its mother after only two weeks, and is eating termites at 9 weeks and is weaned by 16 weeks. By three months of age the young has been weaned. At six months of age, it is able to dig its own burrows, but it will often remain with the mother until the next mating season, and is sexually mature from approximately two years of age. In the military, the Air Force supersonic fighter-bomber F-111/FB-111 was nicknamed the Aardvark because of its long nose resembling the animal. It also had similarities with its nocturnal missions flown at a very low level employing ordnance that could penetrate deep into the ground. In the US Navy, the squadron VF-114 was nicknamed the Aardvarks, flying F-4's and then F-14's. The squadron mascot was adapted from the animal in the comic strip B.C., which the F-4 was said to resemble. ↑ Cote S, Werdelin L, Seiffert ER, Barry JC (March 2007). "Additional material of the enigmatic Early Miocene mammal Kelba and its relationship to the order Ptolemaiida". Proc Natl Acad Sci USA. 104 (13): 5510–5. Bibcode:2007PNAS..104.5510C. doi:10.1073/pnas.0700441104. PMC 1838468 . PMID 17372202. ↑ Seiffert, Erik R (2007). "A new estimate of afrotherian phylogeny based on simultaneous analysis of genomic, morphological, and fossil evidence". BMC Evolutionary Biology. 7 (1): 224. doi:10.1186/1471-2148-7-224. PMC 2248600 . PMID 17999766. ↑ Buckley, M. 2013. A molecular phylogeny of Plesiorycteropus reassigns the extinct mammalian order 'Bibymalagasia'. PLoS ONE 8(3):e59614. ↑ Chisholm, Hugh, ed. (1911). "Aard-vark". Encyclopædia Britannica. 1 (11th ed.). Cambridge University Press. p. 2. Anon (2013). "All About Aardvarks". Easy Science for Kids. Online Science Tutor for Kids. Retrieved 2013-11-18. Anon (2013a). "Rainforest Aardvark". Animal Corner. Retrieved 10 January 2014. Rahm, Urs (1990). "Tubulidentates: Aardvark". In Parker, Sybil P. Grzimek's Encyclopedia of Mammals. 4. New York, NY: McGraw-Hill Publishing Company. pp. 450 458. ISBN 0-07-909508-9. Rodriguez, Tommy (2013). "Technological Perspectives in Phylogeny Research: Revisiting Comparative Analysis of Complete Mitochondrial Genomes for Time-Extended Lineages" (PDF). Figshare: 1–9. doi:10.6084/m9.figshare.804317. Shoshani, Jeheskel (2002). "Tubulidentata". In Robertson, Sarah. Encyclopedia of Life Sciences. 18: Svedberg, Theodor to Two-hybrid and Related Systems. London, UK: Nature Publishing Group. ISBN 1-56159-274-9. Taylor, W. A.; Skinner, J. D. (2004). "Adaptations of the Aardvark for Survival in the Karoo: A Review". Transactions of the Royal Society of South Africa. Taylor & Francis. 59 (2): 105–108. doi:10.1080/00359190409519169. van Aarde, Rudi J. (1984). "Aardvark". In Macdonald, David. The Encyclopedia of Mammals. New York, NY: Facts on File Publications. ISBN 0-87196-871-1. "Aardvark". The New Student's Reference Work. 1914. "Aard-vark". Collier's New Encyclopedia. 1921.